Update: As of 1:00 pm on December 1, 2017, this giveaway is closed. Confession: Sometimes I need to be reminded that it’s going to be okay. This is not the same thing as pretending it’s okay when it’s not, as I wrote in my last post – I mean I need to be reminded that it’s going to be okay in the end. I’ve never been sure if I’m a pessimist or an optimist, because I try to put a good face on everything, especially if you meet up with me in real life, but hidden inside myself I’m often sure we’re all going down, boys. My husband, on the other hand, has more than his share of snark and cynicism, but underneath it all, a constant certainty that we’ve turned the corner. He’s relaxed, it’s going to end well, and life is good. I love his steady perspective and rely on it more heavily than anyone guesses (except him) (and sometimes not even him), but from time to time I really need to hear a woman older than me say that it’s going to be okay. What is the “it”? It’s mothering, pastor’s wife-ing, mistakes, canning season, science experiments in the boys’ bedroom, wintertime, life. It may not be easy, but it’s going to be okay. This week I remembered why I love Dorcas Smucker so much as an author and a friend: she’s a beautiful optimist. The ugly kind of optimist is the one that denies any hardship or pain, but delights in throwing solutions around. Stop crying, hon. Chin up. The beautiful kind of optimist is the one who’s seen a lot, handled a lot, freaked out a lot, and come full circle to the satisfying rest of experienced living: not much is worth hyperventilating about. Relax, hon. Cry, breathe, smile. Try again. 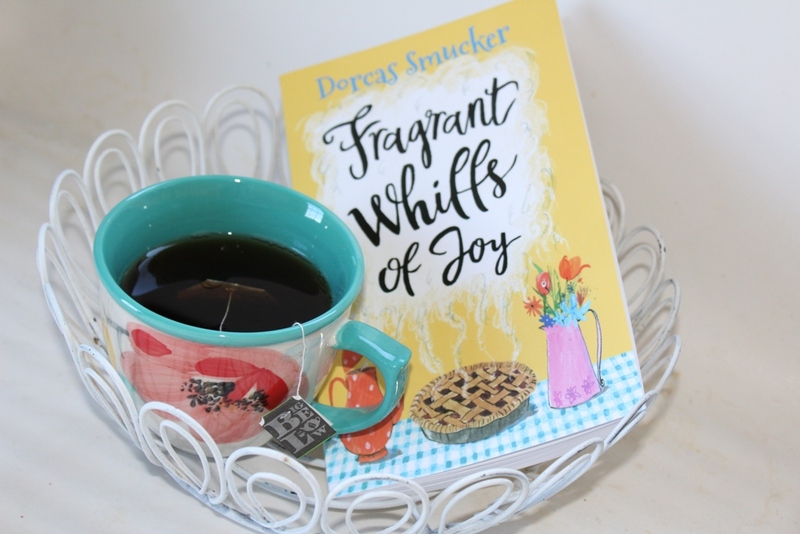 Dorcas recently released a new book, Fragrant Whiffs of Joy, a fresh collection of the newspaper articles she writes for the Eugene Register-Guard. She’s stopping by here today (kum ba ya, my Lord) to share a copy with you. When I sit with Dorcas, which isn’t nearly often enough, she usually has a cup of tea in hand. She’s been an important sounding board for me in writing, mothering, and letting go of shame. Thankfully I had a sense of humor, and the girl who played this part was not easily discouraged, because for some reason she could not recite that line. “Oh I am so tired and hungry!” she would say before collapsing into the snowbank: a pile of quilt batting from the sewing circle, covered with a white sheet. I am not sure that she ever got it right, even on the night of the program. I should have let her ad lib, I guess, because she had the right idea. The original line is now seared into my memory, and I always think of it at times like this. I think you need this book. If you’re interested in owning a copy, you have two choices: one whimsical and one practical. First, you may leave a comment below and be entered in a drawing to win one copy that Dorcas and I are giving away today. Second, you can order the book directly from Dorcas – that way it’s guaranteed. Or you can try the first option first, and if that doesn’t work, go on to the second. That ought to do the trick. To order a book, contact Dorcas Smucker at 31148 Substation Drive, Harrisburg, OR 97446, or [email protected]. 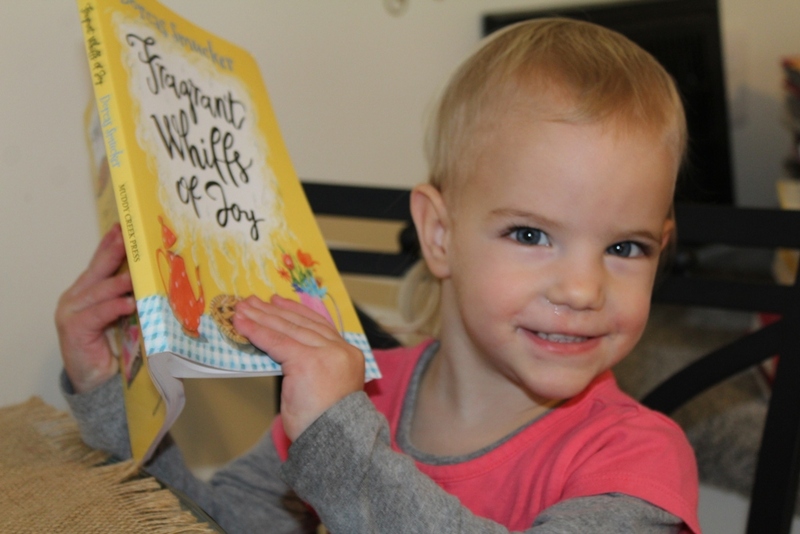 Fragrant Whiffs of Joy is priced at $12 each plus $2 postage. Checks or PayPal accepted. Discounts available for combination orders. Also available here on Amazon. Would you like to own this book? Please drop a comment below; I’d love to hear from you. I was given three copies of FWOJ – one to give to a blog reader, one to give to a personal friend who had a tough year, and one to keep. Giveaway will close in one week. Open to US residents only. Winner will be chosen by random.org. Update: As of December 1, 2017, this giveaway is closed. Have a great day! I’d love to win. ? I would love to win this book! I love all her books. Wouldn’t it be great if I’d win??….. No postage or packaging for you! I think you’d qualify for the friend that’s had a tough year. 🙂 Blessings to you and your daughter. I hope you win. I wouldn’t mind winning a good read! ? A comment. Any comment? Yes, I am in need of this kind of new breeze as well. I enjoy your blog and it would be fun to win this book! I have really enjoyed Dorcas’s previous books, and would be delighted to add this to my pile. Sounds like a good Chris gift for my mom….that I would read first. I Would love to read her new book! Sounds delightful! Laughing with my boys over this comment! I just found this blog from someone’s what’s app status. It’s what I need. God bless you as you serve Him!!! I love her books- so fun and refreshing! Dorcas is one of those people I’m looking forward to someday getting to know- hopefully in a relaxed sort of way over a cup of tea. For now I’ll have to be content with her books. Sounds like another good book by Dorcas!!! Sounds so refreshing! Thanks for the reminder that “it will be okay in the end” -needed that reminder this morning. Whiffs of joy around this time include pumpkin pie, sweet potatoes, Carmel lattes . I would love to give this book to a friend of mine who has had a trying year as a single mom . Discovered your blog through another friend’s blog. Enjoy your perspective. Would love to win this book. I’ll try winning this book one more time, before I go and order it for myself. Would enjoy reading the book. I would love to win this book! A person can never have too many good books to read and I know this one would be good!! I enjoy Dorcas’ writings very much! Would love to enjoy more! I’ve long been a reader of Dorcas’ blog. She cracks me up and reassures me and is so relatable. So much wisdom from a mom who’s been there. I’d love to win a copy of this book! I like your writing style and I would like very much to read one of Dorcas’s books! Lovely review… and I’d love to win this book! I love her books and her writing style. I’d be delighted to own the book! I love your review and I would love to win this book. Would love to win a new book-I love to read! Long been a fan of Dorcas’ writing and would love to win this book! Don’t see the comment I tried posting before, so I’ll try again cause I really want to win this book! ? Thank you, Regina. That is correct. You articulated the optimism/pessimism/realism dilemma so well. Thank you! And Dorcas’s writing is delightful: if you’re the one who introduced me (I can’t remember now), then thank you! Sounds like a good book for helping a mom gain fresh perspective! She (and you!!!) have a way with words that articulates what I need so many times. Thanks for entering me. Ah yes, I’d love to win! And I’ve so enjoyed her blog tour. Meeting lots of new bloggers. Well, I wasn’t actually going to enter the giveaway for really dumb reasons but now that I’m a reader of this blog now, I figure why not? So here I am. I would love to win this book!! I keep wanting to order some of her books!! Never read any of her books… Keep up with her blog, tho. Whee! I missed this book on Anita’s blog, but imagine a second chance! I’d love to read this and then pass it to my mom, who is an avid Dorcas fan. Winning something from a blog giveaway would be good; having it be Dorcas’s book would be even better! Well so far I have not had any luck winning a book, though I have faithfully commented for two long weeks! ? I feel lucky on this, the last day. Fingers crossed! P.S. I have all if Dorcas’s other books. Big fan right here. I love her books! Would have bought one today but the store I was in didn’t have them yet… of course I’d rather win one anyway ? 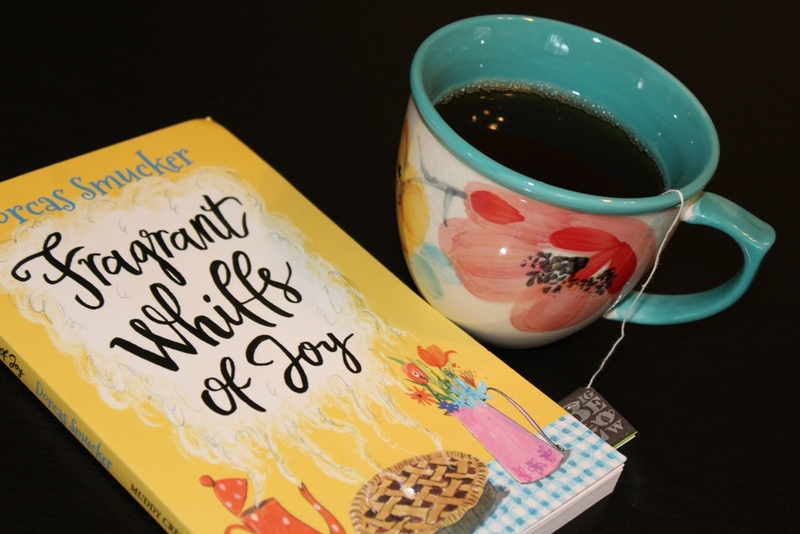 I could definitely use a whimsical whiff of joy! Please enter my name! Feel like I am repeating everyone else- but yes, it would be fun to win Dorcas’ book. And thanks for your blog as well! I enjoy Dorcas’s writings, and yours too, I’ve discovered! I would love to read this book! ? I’ve enjoyed Dorcas’ other books and would love to read this one too! Since you and Dorcas are two of my favourite bloggers, I must enter my name here. You both inspire me so much. oops, ignore me. I’m not from the US. Oh hey, come on. Surely you have an American friend who could be persuaded to “borrow” the book until you get to visit her? 🙂 All I need is an American mailing address to send it to, and you’re good. That’s up to you. But thanks for your kind words. Along with everyone else commenting, I’d love to win this book! 😉 And I really like your evaluation of optimism, you put into words some of my thoughts! I’ve been hearing a lot about this book and would like to read it. So, I’ll take a try at option #1. Yes I’ll try this then if this doesn’t work out I’ll order it. 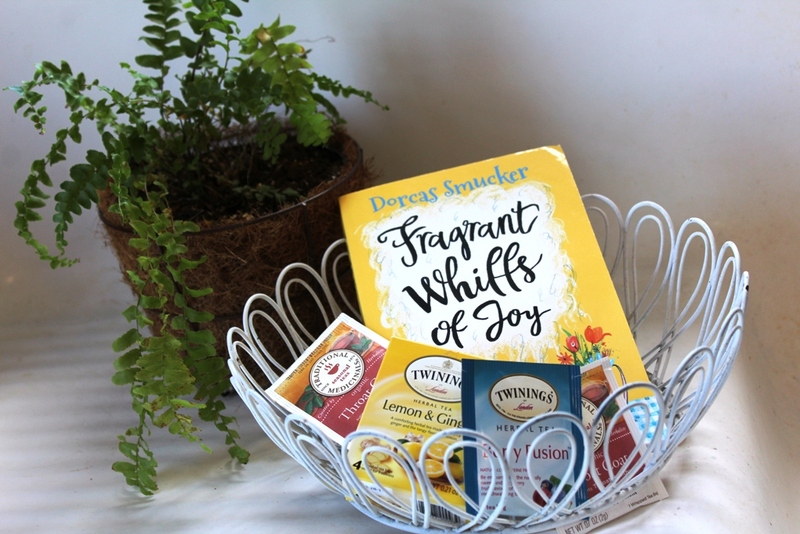 I love Dorcas writings and would love to win this new book. Winning her book would be such a treat! I COULD just go order one, couldn’t I?? I have read Dorcas’ other books over and over. And I’m so happy I now know about your blog too! I’d love to win this book. I’ve only read one of her books but I’d like to read them all. Dorcas’ writing always warms my heart and makes me hope to be as inspiring as her when I’ve lived as many years. Can’t say I’ve read any of Dorcas’ books…I suppose now would be a great time to change that! Enjoy her blog and books! Would be delighted to be the winner! Sounds interesting! I haven’t read any of her books. I would also enjoy wrapping and giving it to a close friend who is going through some rough times. Just read your previous blog post as well, and it confirmed that my next post to write will be “Silver Linings.” It’s more than okay to admit the clouds of gray are not okay. And I enjoy Dorcas Smucker, even though I’m not a mother. I would love this book! I would love to win the book! And I like your blog, too! Hi! I would really enjoy this book! I don’t usually win these things, but hey it’s worth a try! 🙂 I want to read it and pass it onto my mom! Thank you for sharing the quote from Dorcas about adulthood and making peace with the life you didn’t foresee…that quote made me stop and take the time to enter in hopes of winning the book. ? I’d love to have some good reading material this winter! How thrilling to win this book! I love her style of writing. As much as I love reading Dorcas’s writings, I don’t own any of her books. Winning one would remedy that. ? Love to read this book!! I would love to win this book for my friend who has had a hard time this year. Another giveaway! One more try at winning! ?This book would be the perfect birthday gift to myself lol! Just the encouragement this mom needs! And I’d love to share it with friends/family. Pls pick me!! ? I love the honesty of your blog! I too enjoy Dorcas’s down to earth writing. I like your description of a beautiful optimist. And I would love to have a copy of Dorcas’ newest book. I don’t think I’ve ever won a giveaway… maybe this will be a first? I’d be happy to win this for a friend. My mom has several of Dorcas’s books. I am currently borrowing one and enjoying reading it aloud to my husband. If I would win the book, I would probably give it to Mom to add to her collection where the rest of us could borrow and enjoy as well. I certainly am a pessimist when it comes to entering giveaways…but I suppose it won’t hurt to try again to win this book. Maybe I should just stick with the guaranteed way after this. I love to read Dorcas’s writing. Would be delighted to win! Dorcas Smucker is my favorite author. Have you written any books? I enjoy reading your blog. I enjoy reading Dorcas’ blog (and yours as well!) and I’d love to read her book. There is never too many books! I would love to read this one! Dorcas spoke at my church back in the days when I had one small child that never seemed to stop screaming and a small voice in my head telling me it must be my fault. I’ve read her blog ever since. I’d love this book. Oh, yes! Another try at winning this book. Certainly this will be the ticket. A chance at owning this book for free?! Of course I have to try! I guess I’m taking the whimsical route, again! I’d love to win this book! I would be delighted to win this book! This book looks fantastic, thank you for the chance to win a copy! I have already ordered three copies of this book for gifts…but winning a copy would allow me to spread the joy a little further. You and Dorcas both have the gift of painting with words; y’all are my favorite bloggers. If your giveaway is still open, thank you for the chance to win Dorcas’ book. Her blog and yours are my favorites of the handful that I still follow. Yes ma’am, open until Friday! 🙂 Thank you. 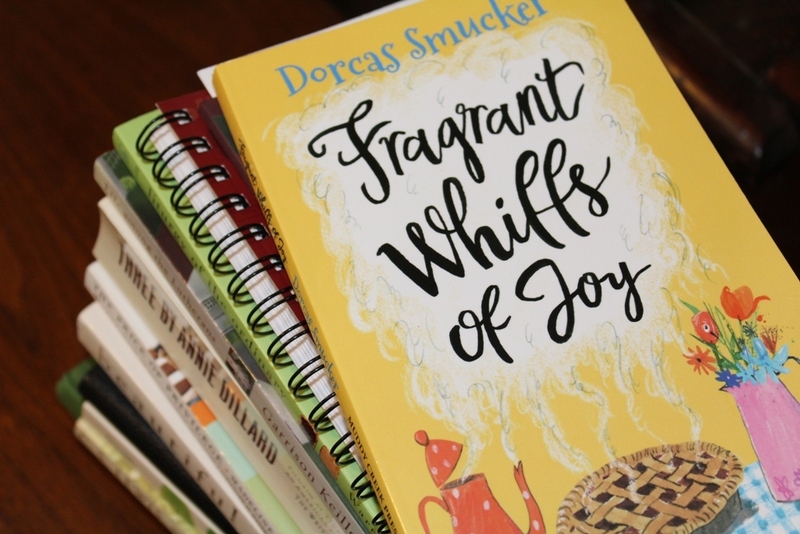 I love dorcas smucker’s books! Pick me! Pick me! 🙂 Thanks for this chance to win! I’d love to win. Along with over 125 other people. May I win this book please? Sounds like a interesting book to read! I’ve entered to win Dorcas’s new book a dozen times. Think this will be the lucky one? I’d love to win the book too. Thanks Shari for sharing with us in this way and with your blog. I enjoy reading it. I just realized this evening that it’s been awhile since I read Dorcas’s blog and when I did I discovered the giveaways. I hope I’m not too late! I would love to win this book but if I don’t I can always buy it. ? Can’t wait to read her new book! Coming in at the eleventh hour… or maybe it’s passed. I’m still recovering from a literal Thanksgiving week and could use some fragrant whiffs. Thanks for giving me a chance. You made it just in time. 🙂 And yes, that’s my baby all grown up. Oh, and is that your baby?! She has such a grown-up look. Adorable.